The Platonic Realms website is a project initiated by a small group of math and math education graduate students, led by B. Sidney Smith, at the University of Colorado at Boulder. The group\'s goal is \"to provide high-quality mathematical content for secondary-school and college students that was free, motivational, and instructional.\" The introductory page features a historical note, a daily quotation, a daily mathematics challenge, humorous articles, and a \"math moment\" which uses multi-media technology to illustrate a mathematics topic, such as prime numbers. The Interactive Quotes Database allows visitors to search quotes by author, topic, and key phrase. 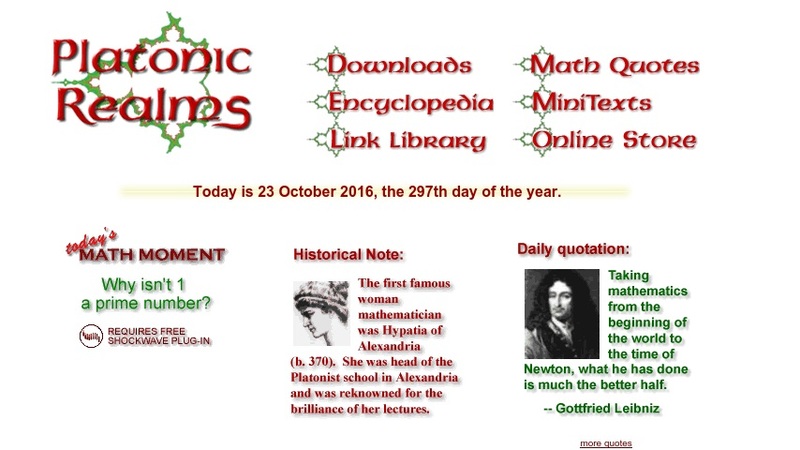 Visitors can also browse the PRIME Math Encyclopedia, which has almost 1,000 entries of contributed by \"associate editors from university math departments around the world.\" The MiniTexts section of the website presents articles on mathematics topics, such as infinity or math anxiety, at an introductory or developmental math level. Another section offers teaching aids, games, and articles to download for a small fee. The site notes that the group\'s privacy and content policies are very strict, so there are no annoying advertisements. However, a few select sponsors are listed in the link library and help keep the project running.